There is a scene from the movie “Monty Python and the Holy Grail” where a wagon stacked with bodies is being pulled through a plague infested medieval village while a crier calls out “bring out your dead.” The comedy in that grim scene comes when a man tries to load a body slung over his shoulder onto the wagon and against the protests of the still quite alive “dead man” who says such things as “but I’m not dead,” I’m feeling better,” and “I think I will go for a walk.” I am reminded of that movie scene every time I hear proclamations about NH being the 1st or 2nd oldest state in the nation. 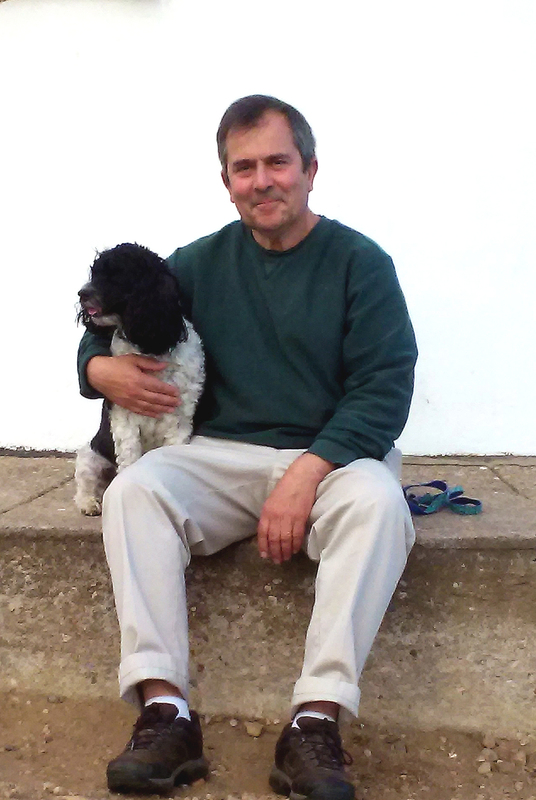 An excellent radio program in NH (especially when I am guest – I wasn’t on this broadcast) recently spent an hour discussing the implications of NH being “the second oldest state in the nation.” The operational definition of “second oldest state” was never given but I assume it is based on the median age of the state’s population. Using 5 year Census Bureau estimates (2010-14) NH has the third highest median age of any state in the nation (collective gasp here), behind only Maine and Vermont. Before administering the sacrament of the anointing of the sick to New Hampshire, however, understand that a state’s median age says relatively little about the age distribution of a population and even less about the demographic and public policy challenges (and their severity) that a state will confront in the future. 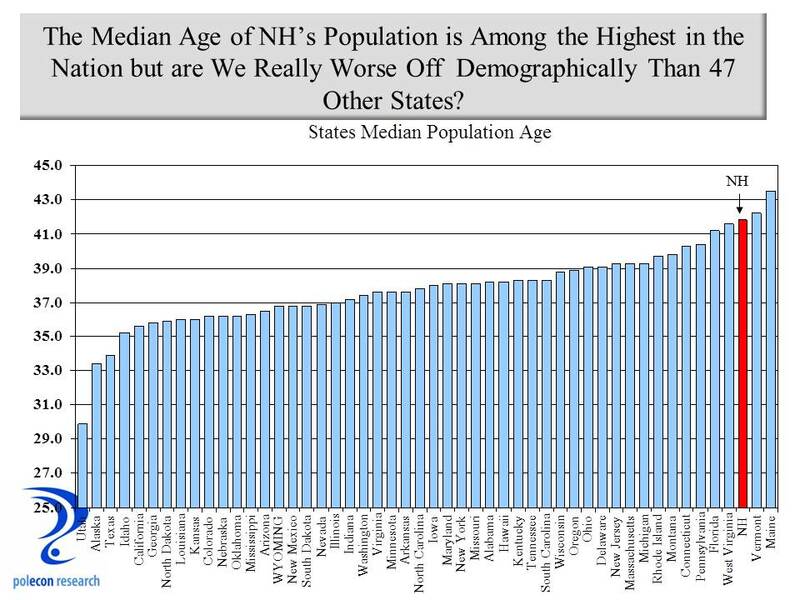 Does NH’s high median age really mean our state is worse off demographically than 47 other states? First, a high median age doesn’t mean NH has a disproportionate number of elderly residents. It does mean, and has for some time, that NH has a high percentage of residents in the middle of the age distribution and fewer at early ages. As the chart below shows, on the percentage of the population age 65+, NH ranks 15th among all states and below many states with a lower median age. Second as I argued here, if you want to understand the strains that an older demographic may place on the fiscal system of a state or a nation you need to look at the “old age dependency ratio,” or the number of older residents in relation to the number of working-age residents because that is a measure of the population that will largely be paying for or supporting the services for the older population. There will be more elderly in NH and that will increase service needs but the fiscal pressures those needs place on the state is a function of both the number in need of services and the number of working age individuals supporting the services (that is why China’s “one-child” policy that results in four grandparents, two parents, and one child was always a demographic ponzi scheme). The old-age dependency ratio is rising in NH but again, on that metric, NH hardly looks that much worse off than most states as it is firmly in the middle of all states on the ratio of residents age 65+ to working age residents. In addition, because NH has relatively healthier and more well-off older residents compared to many states, our dependency ratio probably slightly overstates the challenge the old-age dependency ratio presents to the state. With NH’s lowest in the nation birth rates the old-age dependency ratio could rise rapidly depending on migration trends (as has been the case in recent years) and is one more reason to want to make our state broadly appealing to demographic groups. NH does face significant demographic challenges and if overstating their magnitude is necessary for action to address them then I guess I can live with that. But too often the discussions of the demographic challenges facing NH are laced with agenda driven diagnoses and prescriptions that make for great headlines but ineffective policies. Low birth rates (NH now has the lowest in the nation) resulting from high labor force participation and levels of educational attainment among women in NH (a sign of our state’s successes not our failures) along with low mortality rates among an older population that is both healthier and wealthier (on average) than in most states, is a recipe for a higher median age in a state. That is unless median age can be made more stationary through the in-migration of younger residents, or as NH has traditionally done, in-migration of residents more in the middle of the age distribution along with their children. That was exactly NH’s recipe for success for decades even as young people have left the state (a decades long trend in NH), at least until net state-to-state migration slowed in NH, just as it has been slowing nationally for some time. Between 2010 and 2015, the Census Bureau estimates that about 5,500 more NH residents moved out-of-state than residents of other states moved in, with about 6,700 more moving out of Hillsborough County than moved in, while about 4,500 more residents moved into Rockingham and Strafford Counties than moved out during that time. The graphic below disputes the notion that NH is no longer a place that people want to locate, they are just being more selective in where they choose to locate in the state. Examining the differences in population growth and demographic changes among individual communities within these counties further suggests some of the factors that can contribute to in-migration and inform public policies that seek to address NH’s demographic challenges. Not all communities experienced the growth or decline in migration characteristic of their counties. 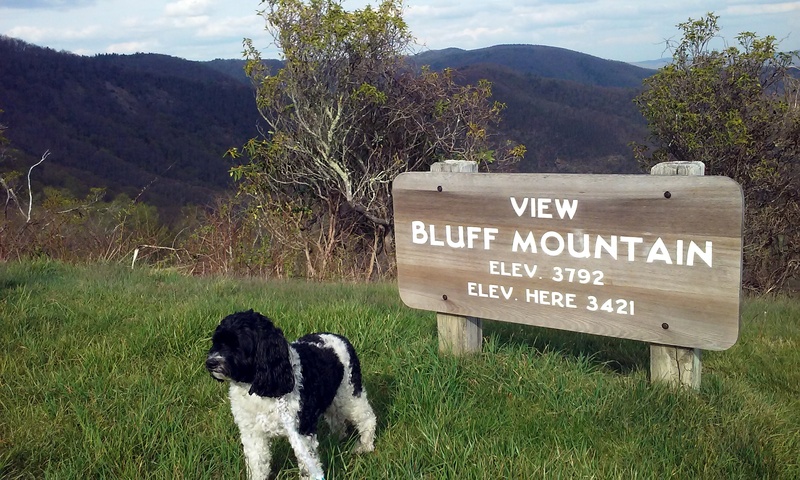 Understanding why is important to the future of our state and its communities. It is more than just nearby job opportunities or Hillsborough County would not have seen so much out-migration. 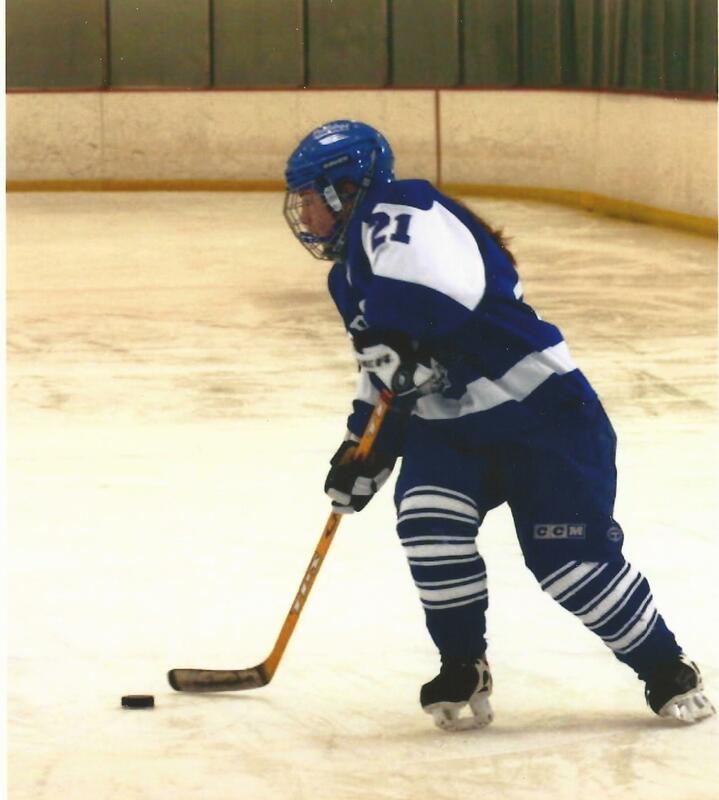 I have written about some of the factors in prior blog posts. Many communities are aging more slowly than the state as a whole and their experiences are illustrative of some of the factors and actions that can influence the age structure of a state or a community. Yet policy discussions about demographics at the state level typically overlook positive demographic trends in many communities in the state. Below is a chart that highlights how the median age has changed over two decades in just a few NH communities. The chart shows the median age of each community in 1990, and then incrementally adds how much the median age has changed in each of the following two decades. There was relatively little difference in the median age of each community’s population in 1990, but especially in the 2000 to 2010 decade, the rate of change in median age varied significantly among the communities. Communities such as Portsmouth, which had a relatively high median age until 2000, slowed its rate of “aging” dramatically in the 2000s, as did Dover and Manchester, albeit for different reasons and with different demographics. The point is that if some regions and some communities in NH can rage against the dying of the light, others and maybe even the state as a whole, can as well. So, while many want to heap NH onto a metaphorical “death wagon,” let me say “but NH is not dead, I think we should go for a walk today”. Lawmakers want to do the right thing on the minimum wage issue and even if some don’t, the issue is a highly symbolic indicator of one’s position on a number of important policy issues. That’s too bad because it reduces the probability that the issue will be decided entirely on its merits (benefits versus costs). With so much hyperbole on both sides of the debate it is difficult to know what the “right thing” is and raising wages for those at the bottom of the wage scale has a lot of appeal as an easier and faster way to augment income than is increasing the productivity and educational attainment of individuals. This month the U.S. Bureau of Labor Statistics (BLS) issued a brief report on minimum wage workers. Anyone interested in the policy debates about minimum wage should at least peruse “Characteristics of Minimum Wage Workers, 2013.” According to the BLS, about 59 percent of workers in this country are paid on an hourly basis and the percentage of that group that is working at or below the minimum wage declined to 4.3 percent last year. Thus about 2.6 percent of all workers (those paid hourly and those on salary) are paid at or below the minimum wage. 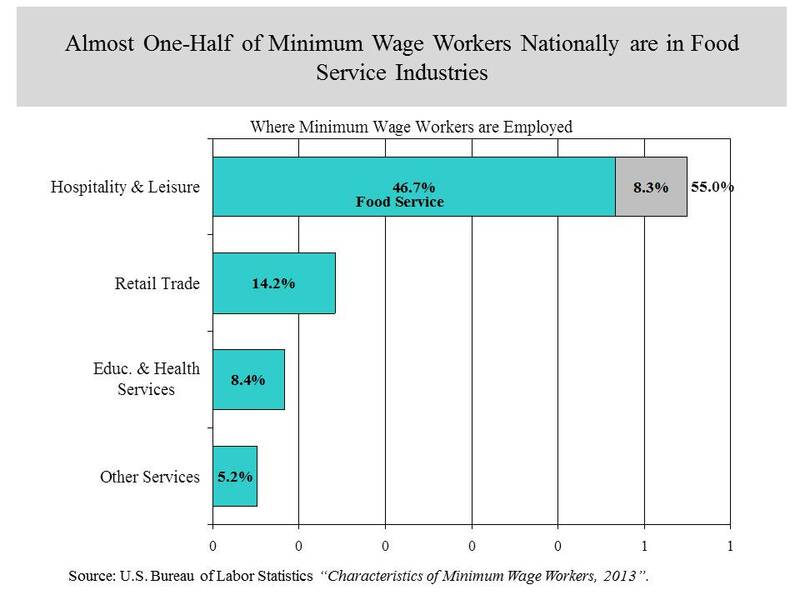 Most of those workers are employed in a few industries, led by the food service industry which employs nearly one-half of all workers making at or below the minimum wage. New Hampshire is immersed in its own debate over raising the state’s minimum wage. In what was largely a symbolic measure, the prior legislature repealed the minimum wage and the current legislature looks to reinstate and raise the minimum wage in the state. My analysis of data from the U.S. Census and BLS’s “Current Population Survey” (CPS) indicates that about 10,000 workers in NH earn at or below the national minimum wage of $7.25 (this number is slightly below the 11,000 estimate in the BLS report, but that report rounds the NH estimate so the discrepancy is probably less and well within the CPS’s sampling error). Another 16,200 earn between $7.25 and the proposed new state minimum of $8.25. Thus about 26,000 hourly workers, about two-thirds of whom are mostly in the food services and retail industries, would be affected by a $8.25 minimum wage. A second proposed increase to $9.00 would affect another 13,600 workers. So all told, about 40,000 workers or about six percent of all workers in the state could be affected. 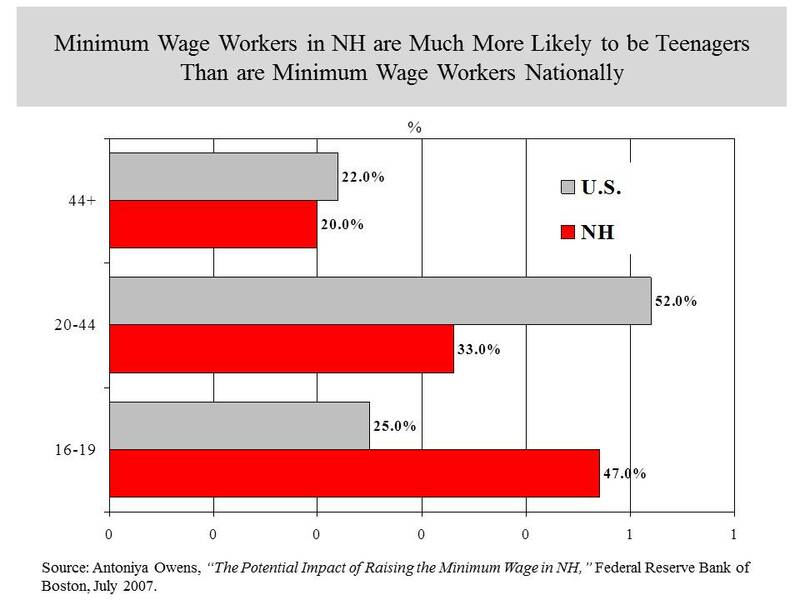 I did not analyze the age composition of NH’s minimum wage workers but a 2007 study by the Federal Reserve Bank of Boston did and they conclude that younger workers comprise a larger portion of minimum wage workers in NH than in the U.S. as a whole. Almost one-half of workers at the minimum in NH are teenagers age 16-19 (chart below). Whatever the result of NH’s minimum wage debate, a lot of people earning far more than minimum are working to influence the outcome. I have no personal or professional stake in the minimum wage debate but I like the issue because it is a documentary on highly-charged policy fights, combining real and perceived forces of good and darkness: economics, emotion, populism, ideology, compassion, greed, idealism, labor versus management, as well as wealth versus want. The minimum wage debate also provides some of the clearest examples of the tradeoffs involved in public policy choices. In this case, the tradeoff is raising wages for some while reducing the employment opportunities (hours or jobs) for others. Despite what the media say, and the President’s statement that “there’s no solid evidence that a higher minimum wage costs jobs,” most economists do agree that minimum wage increases result in some economic damages (reducing employment). They don’t agree on everything about the impacts of the minimum wage, however, and a good number of reasonable economists believe that the negative employment impacts from minimum wages are offset or even outweighed by the benefits. The negative employment impacts are substantial but do not appear, to me at least, to be dramatic, which of course is a fairly insensitive view that could only be held by someone not negatively impacted by an increase in the minimum wage (who are likely to be the least skilled and with the fewest economic opportunities among us). In any case, having some negative impacts is not, in itself, enough to reject a policy. Most people, me included, accept the fact that the tradeoff for a compassionate policy that provides a minimal cushion against the ravages of unemployment (unemployment compensation) is some increase in the rate of unemployment. There are just as many or more policies that benefit some businesses or industries but also have some negative competitive impacts or costs to consumers. I don’t have strong feelings either way about re-establishing and raising the state’s minimum wage. 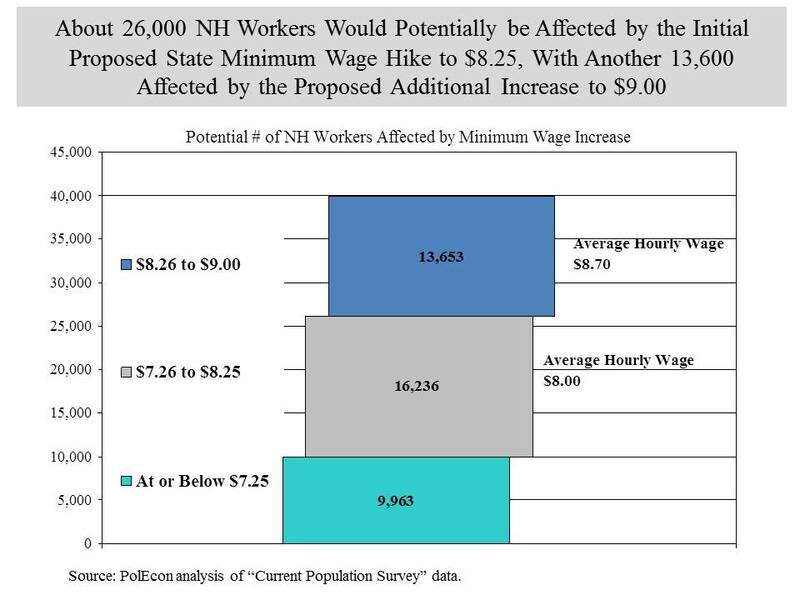 Raising the state’s minimum wage will cost some businesses and/or consumers more and reduce and have some negative impact on employment and hours worked (see the Boston Fed’s study here if you don’t trust me). The chart below demonstrates (too busily) the impacts on a business of an increase in the minimum wage assuming they can’t or don’t raise prices and any increase in the minimum wage comes at the expense of profitability (that is increases is efficiencies can’t offset wage increases). 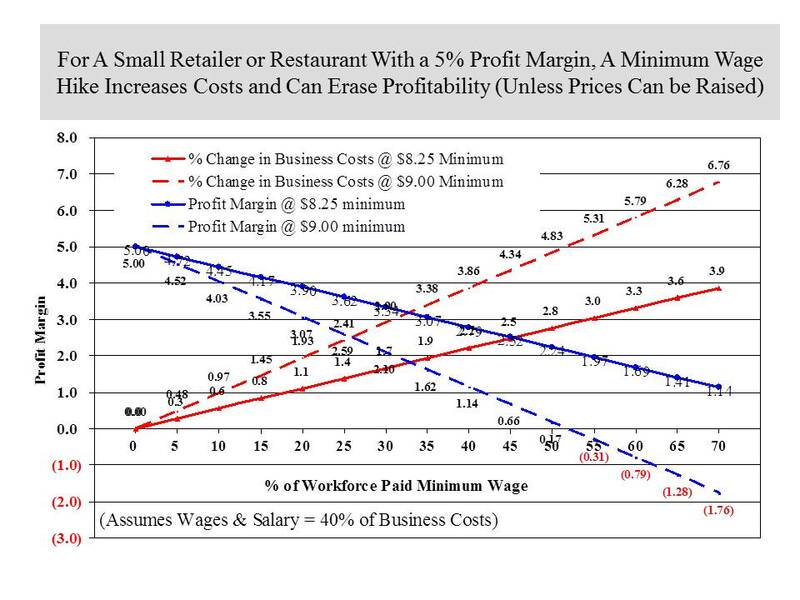 Wages comprise close to 40 percent of business costs for both food service and retail businesses and the high-end of profit margin in those industries is about 5 percent so the chart also incorporates those two assumptions. Depending on what percentage of the businesses’ workforce is currently at or below the minimum wage, the chart shows how business costs increases for both the $8.25 and $9.00 increases (the red lines), as well as how profitability is affected (the blue lines). It may use simplifying assumptions but I think the chart demonstrates why businesses in affected industries are so opposed to a minimum wage increase. While expenses appear to rise modestly, profit margins can quickly erode. My issues with raising the minimum wage tend to be more about the distribution of the impacts than with their magnitude. Freedom from want for working Americans should be a national goal. If augmenting the income of individuals with the least earning power (because of experience, skills, education, etc.) is a national goal, it is it is hard to see why that responsibility should fall only on a few industries that employ these individuals, especially when doing so will only decrease the opportunities for employment. That seems to be the philosophy behind the Earned Income Tax Credit. 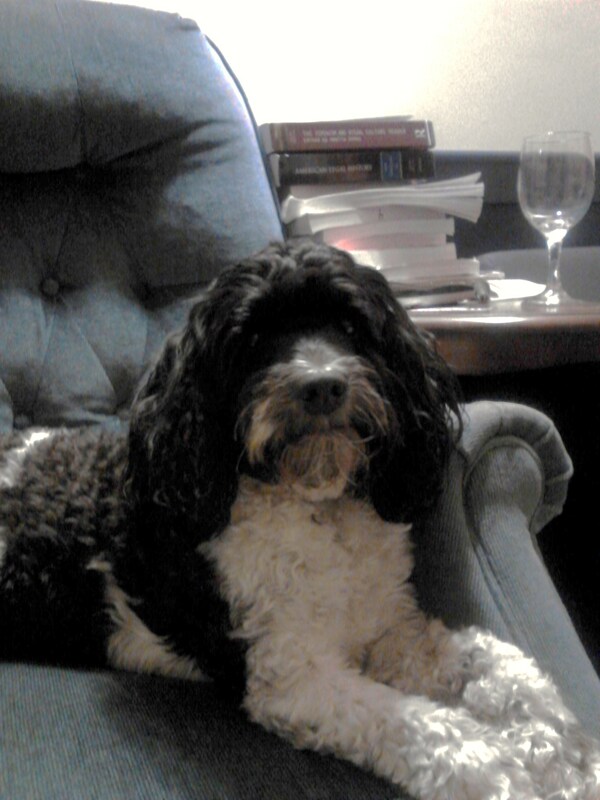 There are other distributional impacts as well. Those with the least opportunities bear the greatest negative employment impacts even as they also receive some benefits. Big companies are more able to absorb higher costs and in any case are less likely to pay minimum wage, so smaller, local businesses already at a cost disadvantage can be put at even more of a competitive disadvantage. This is especially true in rural areas. Small, rural towns have lower costs, especially for real estate, so an increase in the minimum wage gives cities and big companies competitive advantages at the expense of small and rural employers. As is the case with most policy debates, proponents of a minimum wage increase maximize benefits and minimize costs while opponents minimize the benefits while maximizing the costs.